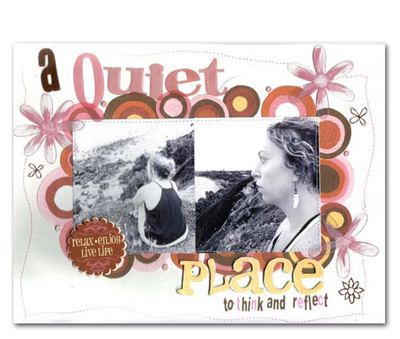 This month Rachel chose to focus her layout on the place where her daughter is most relaxed, and for Megan it is at the beach, playing on the sand or splashing in the sea. She is such a summer girl. Rach chose to keep the layout fairly simple using strips of paper, and then used the chipboard alpha and chipboard plaques down the side. 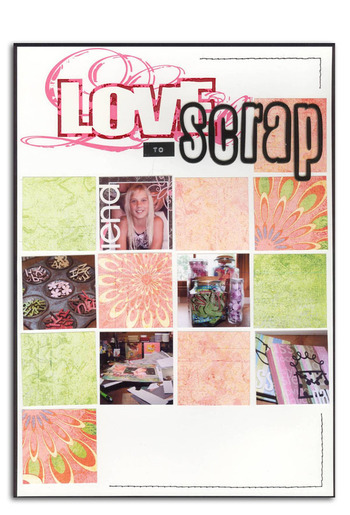 What better way to relax than to scrap? Whether it is just shuffling around a few bits of paper while wandering through countless photos, or knocking out a layout from start to finish, when there are no deadlines looming, scrapping for Caz is her way of taking ‘me time’. Deadlines, on the other hand… well that’s a different story. Lol. Caz couldn’t resist using her favourite Basic Grey papers again, Oh Baby Girl this time. The heading was created using lil Davis products and a dymo labeller and the page is finished with machine stitching. 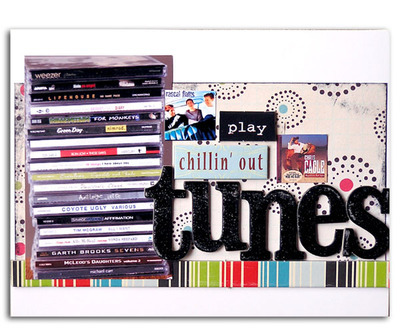 Nic has chosen to do this weeks layout on music, she loves listen to music to relax, and will listen to just about any sort to do this. Nic has used the Li'l Davis chipboard from the For Keeps Magazine. She has also used a mixture of Scenic Route and Li'd davis chipboard to create the title. Sceinc Route papers have been used as a background. Marni is a thinker, she likes to think about everything and when she moved to Mackay she found this place at the top of a look-out and when something is worrying her or she just needs time away from the world this is where she goes. For this layout Marni chose to work with some funky Lil Davis patterned paper and she cut the circles out of the paper to make a frame around her photos. To complement the paper she used some Lil Davis and Heidi Swapp chipboard letters which were the wrong colour so she covered them in paper to match. Marni also used some Lil Daivs rub-ons to finish her title and an onsert from the current For Keeps. Mel (like Marni!) loves her weekend bath, pure luxury, pure indulgence...what could be more relaxing!? The Lil Davis vintage wood chipboard letters were perfect for the large title and they blend ever so nicely with the Heidi Swapp decorative tape (Mel's favourite product at the moment). 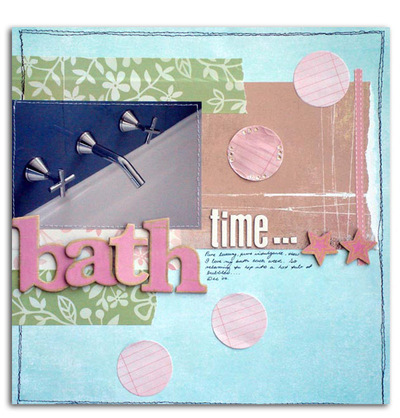 Mel used the Heidi Swapp journaling spots to give the effect of large pink bubbles on the page. She added some Heidi Swapp bling to one of the bubbles and coated this with dimensional magic for a wet and glossy feel. Tamar loves this photo of the girls- shows how cheek y they really are - and is perfect for showcasing why she doesn't get much time to relax - hence the title Relaxation NOT. The Li'l Davis Rock Star papers are double sided and with some thinking Tamar was able to cut the swirls from one side for the top accent and create a journaling strip form the same piece of paper. Tamar doesn't like her handwriting much but the white accents lent itself to a white pen and handwritten journaling. The little glitter chipboard shapes form Lil Davis are very cute - and there are heaps in a packet!